Medford App Design summer camp launched! The Medford camps have kicked off with a resounding success! 4 instructors, and 19 campers arrived at the McGlynn Middle School, this week to start learning and exploring about making apps that run on Android mobile devices. Our concept is to make learning computer science more fun and accessible. And based on the attentive work and very often smiling faces, I would say that we all have been doing an OK job! The campers began Monday, learning basic block coding skills, using an MIT-developed programming environment called App Inventor. 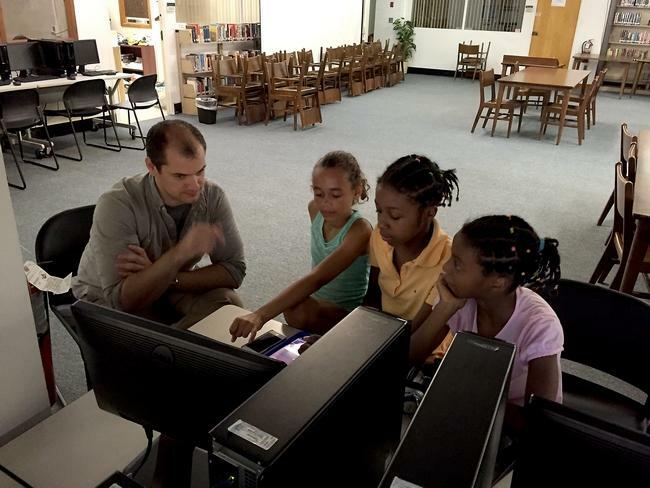 The campers started camp making an app that speaks synthetic language using App Inventor’s Text to Speech component. Then we got the kids jumping (literally!). Using an App Inventor component that measures acceleration, campers made apps that recorded the number of times they jump while holding their tablet. After everyone was done, we had a 10 second Jump Off Contest. One pair of campers managed to jump 29 times in 10 seconds, incredible! The average camper pair jumped 26 times. Fred Martin remarked that when he did this with older programmers they got an average of 10! So these kids have energy! Campers were also shown how to send this information on their jump sessions to a single online database from which the whole camp could see each other’s data. This is called “crowd sourcing,” and from it we could quickly see how others did with their jumps! Campers will be able to use this ability to make apps that collect data from out in the community for others to analyze and maybe even make decisions that can affect the community in some beneficial way! A busy day, right? But there was more! A key critical part of this camp is encourage community connections. Not only does it feel good to have campers work with community members, but research shows that kids get more engaged if the work they do relates to the real world. So in the afternoon on the first day, we invited three exciting community partners. Alicia Hunt came from Medford’s Department of Energy and Environment. She talked about the City’s work with the windmill and also the City’s work helping to preserve the environment. Our second partner was Shanasia Sylman from the Mystic River Watershed Conservation Association. She talked about how in Medford they were concerned with making sure there was ample green space around and near the river in which people could recreate and walk around. Lastly, we had Syrah McGivern, also from the City of Medford, speak about her work with Team Medford, which focuses on making sure all Medford residents have opportunity and access to healthy food and places to exercise. After they presented, everyone gathered around and we discussed ways we could use our skills in making apps so that we could help these organizations with their work in the community. The rest of the week will be devoted to making a final app that they can present back to the community partners and maybe even have the app uploaded to the Google Play Store for all to use! Akira Kamiya produced this video to highlight our project for the NSF “Advancing STEM Learning for All” 2016 Video Showcase. Enjoy! Project research assistant Farzeen Harunani visited Courtney Bell’s classroom on March 11, and led a discussion about her career trajectory, from computer science student to industry professional to researcher. 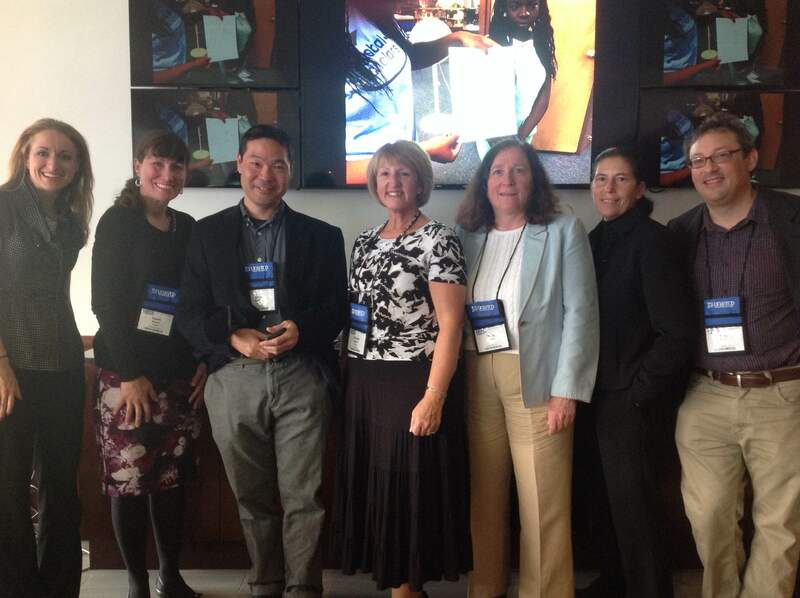 The CS Pathways team members at MassCUE, October 21, 2015. L-R: Erin Natale, Dawn Munro, Akira Kamiya, Denise Salemi, Molly Laden, Lori Blank, and Fred Martin. The CS Pathways team delivered a successful presentation, Middle School Project-Based Computing, at the MassCUE 2015 conference at Gillette Stadium in Foxboro, MA on October 21, 2015. The session immediately followed the opening keynote, and more than 40 conference-goers attended. The presentation was organized by Akira Kamiya, who led the session itself. Molly Laden, Fred Martin, and Everett teachers Denise Salemi and Dawn Munro also contributed. The session covered the goals of the project, provided an overview of the curriculum, and offered live demos of student work from Ms. Salemi’s and Ms. Munro’s spring 2015 classes. A copy of the presentation slides and other handouts from the session are available. CS Pathways summer camps were a huge success! We hosted 72 Everett and Medford middle school students for our 2015 CS Pathways summer camps! The camps were held July 6 through 10, at Medford High School and Everett High School. At Medford, project teacher Mike Scarola was joined by PhD candidate Mark Sherman, along with Jessica Hamerly (Medford Public Schools) and Damian DeMarco (Revere Public Schools) in leading the session. UMass Lowell undergraduate Katherine Brunelle assisted. At Everett, project teachers Denise Salemi and Dawn Munro were joined by Prof. Fred Martin in leading the session. UMass Lowell undergraduate Qiana Curcuru assisted. Akira Kamiya, the project’s Teacher Learning Center Director, made sure all of our technology worked as smoothly as possible. The Everett Independent published a lovely article about the kids’ work.